mimikatz is a tool I've made to learn C and make somes experiments with Windows security. It's now well known to extract plaintexts passwords, hash, PIN code and kerberos tickets from memory. mimikatz can also perform pass-the-hash, pass-the-ticket or build Golden tickets. But that's not all! 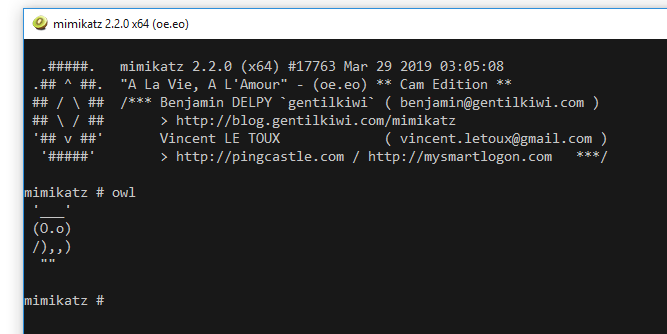 Crypto, Terminal Server, Events, ... lots of informations in the GitHub Wiki https://github.com/gentilkiwi/mimikatz/wiki or on http://blog.gentilkiwi.com (in French, yes). you can have error MSB3073 about _build_.cmd and mimidrv, it's because the driver cannot be build without Windows Driver Kit 7.1 (WinDDK), but mimikatz and mimilib are OK.
For this optional platform, Windows Driver Kit 7.1 (WinDDK) - http://www.microsoft.com/download/details.aspx?id=11800 and Visual Studio 2010 are mandatory, even if you plan to use Visual Studio 2012 or 2013 after. This is a personal development, please respect its philosophy and don't use it for bad things!